Horse show season is slowly starting up and we've got some really exciting news. 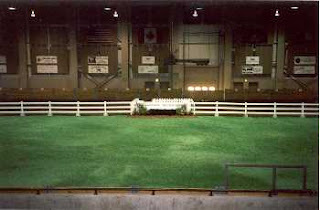 The Western part of the UWO Equestrian team (for which I am the official coach) is going to have an opportunity to show! The English part of the team belong to an association with a number of shows hosted by various Universities each year. Unfortunately there are very few (if any) opportunities for the Western girls. The Western division of the team is very young in comparison to it's English counterparts, but even more determined to run a great show! Since the Western part of the team is run almost solely by Daina Robinson (VP of Western), I have offerred my help and resources to put together a show for UWO vs. Guelph. We are starting from nothing here, and are looking for all the help we can get! 0$ Funding. The university doesn't give any funding to the team, and since the western division is so new, we don't have any previous funds to look to. A facility: we are currently in the process of viewing some of the fantastic facilities that some of our contacts have suggested or volunteered. Again, without funding it's a difficult duty. We need somewhere close to London, with a big enough arena to support 6 to 8 horses at a time for group classes, and a warm-up area/ rest stop for the remaining horses in between individual classes. Restroom facilities, viewing areas, HEAT, lighting, parking etc. are all some of our criteria. Neiiiiiiiggggggghhh! Horses! We can't have a show without horses to ride! Fortunately I am blessed with some fantastic lesson horses that I would love to share for the show (thanks Jessie). Thanks to Don Pletch for offerring some of his horses as well, and to Cathy Cofell for offerring use of her horses ad 6 saddles and bridles! Thanks to Greg Crispin for offering his services as a Judge. Volunteers. No horse show can run smoothly without the helping hands of eager volunteers. Any students, parents, friends who want to be a part of the show we will be needing everything from people to direct parking, to holding horses between classes, to arena clean up, gait openers and closers, to loping horses the morning of the show, to grooming and saddling, to photographers! Have a skill or some supplies you would be willing to lend us? Let me know! Interested in coming out to support Western and watch some of the events? Tentative dates are March 7th or March 28th. I will keep you posted! Ok, ok so I'm jumping the gun maybe just a little with the warmer temperatures, but it's ALMOST here. Before we get used to these temperatures, have a look at these chilly pictures from the day we went to pick up the new lesson horse: J-lo (and yes, she was named for her curvaceous hind end). So what was J-lo doing before we went to pick her up? 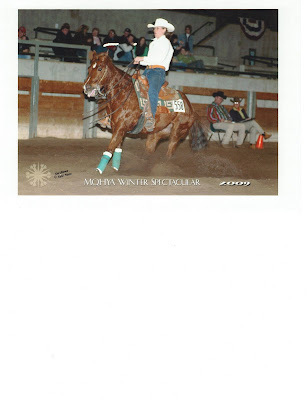 She has an AQHA and NRHA show record, and has been out on lease for the past year and a half. Before that, she was a baby-maker! And here are some of the pictures I got my hands on for everyone anxious to see baby pictures! J-lo has been working out really well so far for everyone who has been riding her. She's just being "phased-in" right now so if you haven't had a chance to ride her yet, you will in the next few weeks! More baby pictures to come soon! Flashback for just a second to holiday/musical rides. Here's a picture of Victoria and Nic with her antlers on. Just a sneak peak of things to come, I'm hoping to get more pictures and even a video to put up for everyone who's been asking. So we packed up the trailer, loaded the horses and took off for the first horse show of the season this past weekend. It was my second show ever on a reining horse and showing in the Open division (against other equine professionals) and my horses first show ever! Jessie brought along the dun colt up at the front of the barn named Hollywood, and another training horse - the cute roan mare for their first and second shows ever. The drive was smooth sailing and the facility was great. It was hosted at the Michigan State University Pavilion and it was HEATED!!! We rode into the night so the horses could have a chance to see and be in the arena with few other horses around. Friday we watched a number of classes including western pleasure, english and western horsemanship, and hunter under saddle. We were the last class of the day and ran pattern 10. I was very pleased with Peanut's performance even though we had a few -1/2 points here and there. We ended up placing 7th out of 14. We competed again on Saturday and had some good points in those patterns as well. We came home with a couple classes under our belts and some more things to work on!